What?//a band.A rock n roll band.Emotional driven rock n roll band. 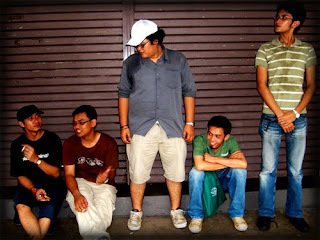 How?//At the end of 2001,Sedang and Izhan who attended the same college,were asked by one of their lecturer,Mr.Shahrul Hezrin to formed a band to play in a ceremony held by UiTM.From there,came Ujay and Sekut.The show was great and Izhan thought a real band should be a good idea.Thus,the band was formed with the original line up : Sedang on mic,Ujay hits the drums,Sekut on bass and both Izhan and Mamat on guitars.The very first recorded material for this line up was the contribution for the Terengganu's Bollok Wok 2 comp. released in the end of 2002.
Who?//Time passes, Ujay, Sedang, Izhan and on occasionally, Kinto and Yazit keep this band breathing. Where?//Besut to Kuala Terengganu to Kuala Lumpur to Klang. ujay menutup 'anu' nye dengan penuh keayuan..